There is some big fish in the village! Thread: There is some big fish in the village! OZZYGUY and Hatari like this. Top one looks like carp, bottom one - no idea. Probably muddy and boney, if they're both fresh water fish. Europeans seem to love carp, we only use them as bait, or blend them for burley ! Im sure Ian will know what they are. We eat a lot of fish, the boney ones are no problem once you master how to eat with your fingers. I'm not sure how long those pictures will remain because the forum site they are on was shut down a year ago and only opened a couple days ago... but for how long I don't know. I'm busy trying to down load the 20,000 pictures I have stored there. The bottom picture is a Featherback, or what the Thais call "Pla Grai". "Pla" in Thai means fish. I only caught one and that was in the evening on bait, and my picture was too dark. The Thai people where I was staying ate it that night, so I never did get a good picture. I've never seen the markings on the bottom one before. Looks from another planet. I've seen them for sale in Thai villages near big reservoirs. They seem to be low light feeders because I've never seen anyone catch them during the day. In all the big reservoirs the locals live on floating lodges perched on bundles of bamboo poles. They have set-lines and nets everywhere. 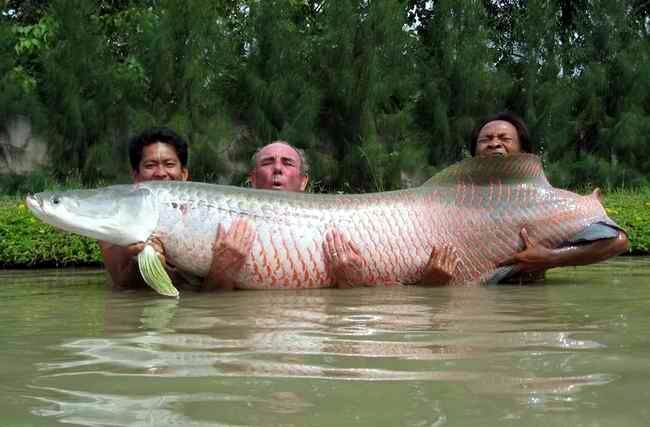 You need to watch river monsters the Thailand episode it will surprise you to the variety ans size of fish there. I went to one of those Fishing Parks in LOS and the Fish that were in the Dam there looked Prehistoric like that pic above of Wabbits . They look like the very popular Pla Aloi? 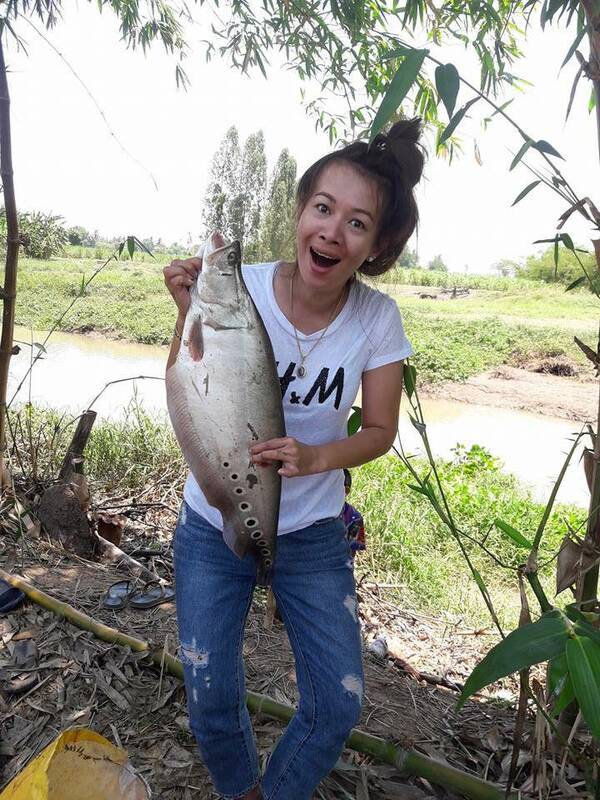 Those Pla Buk are very popular at the catch and release parks, and also in the local ponds next to temples where everyone buys the fish food pellets and tosses them to the fish. There are two varieties. One variety only gets to about 15 pounds at most. The giant Pla Buk have reached weights of 600 pounds. 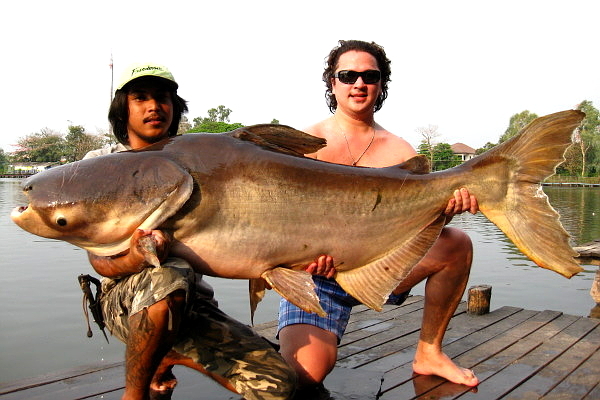 In the big Borsan fishing park in Chiang Mai they get up to 50 pounds. They are plankton feeders and everyone uses bread mixed with various scents and oils. We used a mixture of bread and cheese. It gets mashed into a little coiled ring of steel with a hook or hooks tied close on a short leader. Then the whole contraption is suspended off a float. I've caught them on flies tied to look like bread dough. The biggest fish are in the more expensive fishing resort. Arapaima can be over 7 feet long. If you catch one the resort wants over 100 dollars "landing fee"
And Arawana grow to about 4 feet long. I've taken them on flies. Last edited by Ian Forbes; 10th April 2018 at 14:16.
justcruzing1, Rivo, OZZYGUY and 1 others like this. Bottom one is Pla Graai – ปลากราย or Clown/Spotted Feather-back, mainly a nocturnal fish. I follow a guy on you tube who lives in the north and has a dam that breeds talapia he recently had to drain the dam for some repairs and those spotty fish all got caught and thrown out and eaten as apparently they are a predator to the baby talapia ,he thinks they may have come in as eggs when water from the river nearby was pumped in and just grew having a good feed on fingerlings.